Summary: One of the most distinctive and talented directors of contemporary American cinema, Kelly Reichardt (Meek’s Cutoff, Wendy and Lucy; Old Joy) directs Jesse Eisenberg, Peter Sarsgaard and Dakota Fanning in this tense drama. The three play a group of environmental activists who, though from very different backgrounds, are united by their radical politics. Josh (Eisenberg) is a militant who is determined to protect the earth by any means necessary. He leads them in a sabotage plot that will have far-reaching repercussions. In the aftermath, the conspirators are filled with paranoia and dread leading to an inevitable and shocking climax. It doesn’t take watching many Kelly Reichardt films to realise that she is one of the most gifted filmmakers going around. Films such as Wendy & Lucy and Meek’s Cutoff tell their stories with poetic niceness despite the harsh look at life in general they both have. 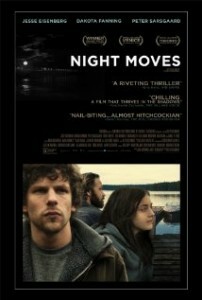 Now Reichardt tries to do the same her new film, Night Moves, but sadly she doesn’t quite pull it off. Reichardt takes the audience into the world of eco-terrorism, doing bad for the great good if you will, a journey we previously took in last year’s release The East. This time around we see the shy and uncertain Josh (Jesse Eisenberg) and scheming ex-marine Harmon (Peter Sarsgaard) conjure up a plan to blow up a dam wall and return nature to its original path. They take the woman with the money Dena (Dakota Fanning) but when the trio’s best laid plans take a turn for the worst they soon find themselves on the run and wary of each other. With Night Moves you can kind of excuse the slow burn lead up to the actual bombing. Its slow pace actually works here and enhances scenes such as Dena trying to acquire the explosives to complete the mission, but Reichardt’s usual style of filmmaking just doesn’t fit or deliver the intensity that is required for the second half of this film to work. What should have been an intense aftermath just seems to plod along. Even the screenplay itself doesn’t deliver its payload to the audience. It nicely sets up a seemingly in place relationship between Josh and Dena but then doesn’t capitalise on the jealousy that should have been generated when Harmon beds Dena while he believes that Josh isn’t around. Likewise the near ‘madness’ and breakdown experienced by Josh and Dena in the aftermath of the terrorist attack are never explored enough, and as a result the film along with the audience’s interest in it just seems to slowly peter out. The people you have to feel sorry for here are the cast. Throughout their careers Eisenberg, Fanning and Sarsgaard have repeatedly shown that they are capable of delivering truly dramatic, intense performances but here they are simply left to flounder by a script that never even gets out of first gear. Night Moves feels like a film that wants to deliver a strong message but just doesn’t have the power to do so. A weak script and some misguided direction (something I never thought I would ever have to see about Reichardt) leaves this film in the ‘average’ bin. And audience members will mostly likely leave the cinema a little bit peeved that they never got to see the explosion itself or the result of the dam wall coming down. Other Subculture Entertainment Reviews of ‘Night Moves′: For our full Night Moves review please check The Good The Bad The Ugly Film Show Ep #96 .